The weekend of 19-21 September provides a great opportunity for welcoming in neighbours and visitors from different traditions. Local faith forums can provide the essential links between religious groups, putting people in touch and encouraging invitations and visits. Download the flyers &/or send links to friends, colleagues, neighbours and networks, encouraging them to open their places of worship to neighbouring communities and visitors during peace weekend. Everyone participating will be part of a world wide weekend of peace-making, truce, reconciliation, conflict transformation, mediation, resilience, ceasefire and a celebration of peace-building. Open House London and Ride N Stride are taking place on the same weekend and can be incorporated into local plans, adding interest and value. A London Peace Conference will take place on Monday 15 September at St Ethelburga’s Centre for Reconciliation and Peace in the City – details to follow. The London Peace Network coalition was brought together to promote peace-making and the Olympic Truce in 2012 and is part of LBFN’s peace-building social lab. The activities around the UN International Day of Peace have been very popular. If you have any questions or would like to know more, please contact the people listed on the flyers or LBFN. This entry was posted in London, London Peace Network, UN International Day of Peace by Catriona Robertson. Bookmark the permalink. 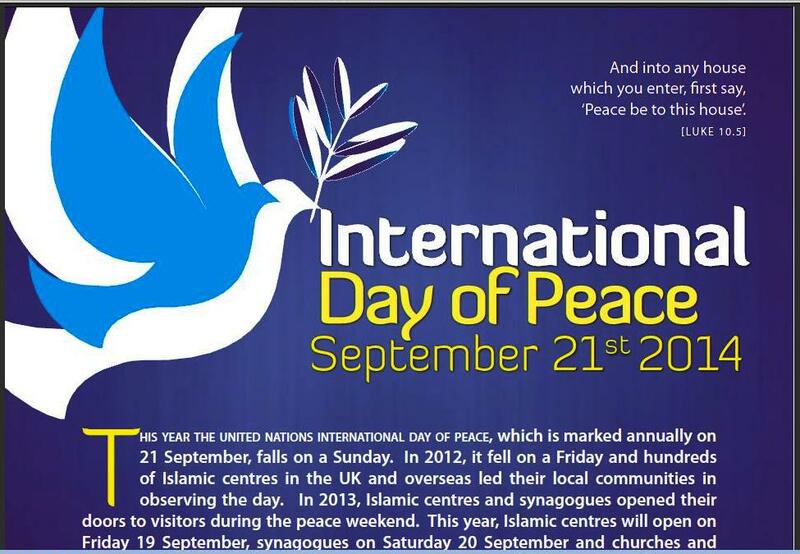 I’m trying to print a Peace Day leaflet but it comes out blank. Am I missing something? The way I do it is to click on the link, download the leaflet and then print it. It seems to work for me – perhaps check the printer settings? Or try a print preview to see what it intends to print? I can send you (& anyone else who would like them) pdfs of the leaflets by email – let me know if you’d like them as attachments.